The Daily Mail fighting for decency again. Three brief observations about the current spleen-venting over England and Scotland's men's football teams not being allowed to wear poppies when they play each other on November 11th. Fifa rarely gets anything right, but in this case I agree with them. If you let British teams commemorate British wars, you cannot prevent Russian, Serbian, Iranian, or any other country whose conflicts you might feel awkward about, commemorating theirs. "We" might all "know" that this isn't the same as Russia celebrating its annexation of Crimea, but that's a distinction likely to be lost on most people around the world. Secondly, if you are going to commemorate conflict, why do you need to wear something to do that? Have we not developed any other forms of communication in the past few millennia of civilisation that we could use at the game? The FA would not be contravening Fifa's laws, I think, if it held a two-minute silence before the match, after showing videos of soldiers' stories. They could arrange for the players on both sides to come on to the field as a mixed company rather than two separate teams, showing that our freedom unites us more than anything can divide us, and the players could then give a guard of honour to veterans. War poetry could be read. A hymn of thanks could be sung. The crowd could hold up a poppy collage. All the revenue generated by the game could be given to the Royal British Legion (the England players always donate their appearance money to charity, incidentally). None of this would require the wearing of a poppy on the pitch during the game and yet we would be remembering together. 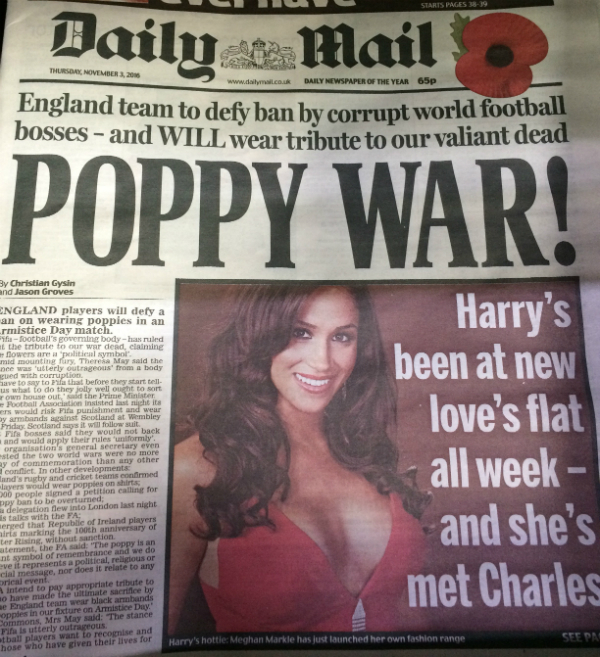 If none of that will do because something must must MUST be worn, the players could all get poppy tattoos, if their employers really care so much. Finally, could everyone calm down? With every (daily) outbreak of hysteria we act more like toddlers than adults, crying and screaming like we are being tortured when what has actually happened is that someone has disagreed with us. We are so free, why act like we are in chains? In a different mood, perhaps, at 11am on the 11th, the nation could stop what it was doing and silently, privately give thanks, then continue their day.